Insiders familiar with this Chinese brand claim that Oppo will skip releasing the R10 and will go straight to R11, a handset that apparently surfaced on GFXBench labeled as "R6051" and features a 20 MP front camera and a 16 MP shooter on the back, most likely a dual camera setup. Since Oppo R9 was followed by the R9 Plus, it looks like the next handset by this popular Chinese brand will not be called R10, but R11. Nothing is official yet, but insiders claim that the Oppo R6051 that recently surfaced on GFXBench would hit the market as Oppo R11. 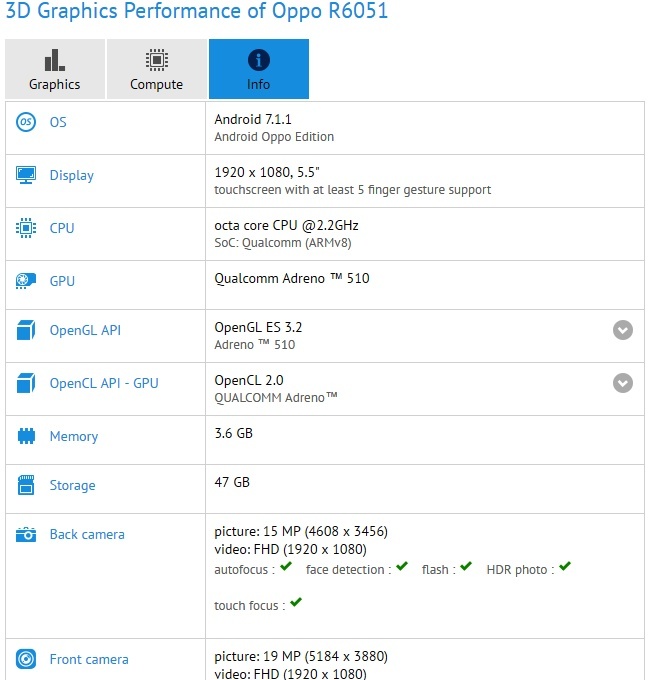 GFXBench reveals the following specs for the R6051 - a 2.2 GHz octa-core processor with Qualcomm Adreno 510 graphics, a 5.5-inch full HD multitouch display, 4 GB RAM, 64 GB internal storage, 16 MP main camera, as well as a 20 MP front image shooter for high-quality selfies. 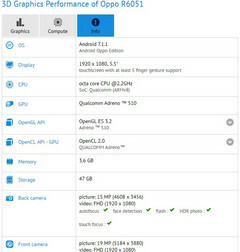 The handset benchmarked runs Android 7.1.1 "Oppo Edition" - most likely a firmware customized with Oppo's interface. Since this looks like a premium handset, it is also possible to see it launch with the 5X zoom dual camera setup that Oppo unveiled at this year's Mobile World Congress show in Barcelona. Rumors also claim that a Plus variant is also in the making, so we only need to wait for the official confirmation to surface online.